This post was contributed by Bill Bowring, Professor of Law in Birkbeck’s School of Law; and a practising barrister at Field Court Chambers, Gray’s Inn. 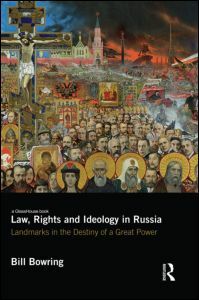 His latest book is Law, Rights and Ideology in Russia: Landmarks in the Destiny of a Great Power (Routledge, 2013). This article was originally published on Who’s Who Legal. On 22 August 2012, after 18 years of negotiations, Russia became the 156th member of the World Trade Organization. As a BBC report pointed out, Russia is the EU’s third biggest trading partner, with member countries exporting €108 billion euros of goods to Russia, including €7 billion worth of cars and €6 billion of medicines. Russia also exports enormous quantities of oil and gas around the world. Despite complications arising from Russia’s actions in Ukraine – including EU and US sanctions on Russian financial and other interests, and Russian sanctions on imports from the EU – the Russian economy and its governance are of great importance to the rest of the world. Does this important step mean that the Russian economy can be compared with those of Western Europe or North America? There is one particularly striking difference. Despite privatisation policies and programmes since 1991, the Russian state still owns two-thirds of the market capitalisation in the Russian stock market. The state’s ownership is concentrated in four strategic sectors: energy (oil, gas and electricity), banks, defence industries and transport. There is little state ownership in most other sectors in the Russian economy, including consumer goods, non-defence manufacturing, agriculture, insurance and services. But it is precisely in the two-thirds of the economy which has remained in state hands, or been seized by the state (as in the expropriation of Yukos, according to the Hague Court of International Arbitration, and the arrest and imprisonment from 2003 to 2013 of its owner Mikhail Khodorkovsky) that the most senior government officials are in control. This includes Igor Sechin, head of the state oil company, Rosneft, which took over the former assets of Yukos. Many of these officials have become incredibly rich. Accession to the WTO was not the first marker of Russia’s participation in the global economic order, especially where corporate social responsibility was concerned. On 10 April 2008 the UN Secretary General Ban Ki-moon spoke at a Moscow meeting of more than 30 Russian business leaders, preparing to establish the Russian network of the UN’s Global Compact. Kofi Annan launched the Compact, which carries ten principles, on 26 July 2000. With over 12,000 corporate participants and other stakeholders from over 145 countries, it is the largest voluntary corporate responsibility initiative in the world. On 17 December 2008 the Russian network adopted its statutes. In 2009 a Report on Corporate Social Responsibility Practices in Russia was published by, the United Nations Development Programme (UNDP), together with the Russian Union of Industrialists and Entrepreneurs (RSPP) and the UN Global Compact Network in Russia. It highlighted the corporate social responsibility commitments of some of the largest Russian enterprises: Viktor Vekselberg’s Renova Group of Companies, employing more than 100,000 people in Russia; Oleg Deripaska’s UC Rusal, the world’s largest aluminium manufacturer; and Vladimir Yevtushenkov’s Sistema investment group. Ironically, Sistema has recently lost its investment in the oil producer Bashneft through court proceedings that have been seen by many as part of the Russian state’s strategy to consolidate its dominance of oil production. Mr Yevtushenkov himself was arrested. The RSPP is headed by Vladimir Shokhin, formerly Russia’s deputy prime minister and minister of economics. It was founded in 1991 following the collapse of the former USSR, and is based on the foundations of the Scientific and Industrial Union (which launched in 1990). It has a membership base of over 120 regional alliances and industry associations representing key industries, including the fuel and energy, machine-building, investment banking, military industrial, construction, chemical and food industries. It has more than 328,000 members representing industrial, scientific, financial and commercial organisations and individual members in all Russian regions. The RSPP is itself responsible for a series of initiatives in the field of social responsibility, including the Global Compact. It has its own Charter of Corporate and Business Ethics, established in 2002, and a Social Charter of Russian Business, adopted at its Congress in 2004 and amended in 2008. It covers 254 businesses and NGOs, and more than 6 million workers. On 20 September 2012, in Sochi, the RSPP promulgated its Anti-Corruption Charter of Russian Business in the presence of the current prime minister Dmitry Medvedev. Some highly influential Western companies promote corporate responsibility in Russia. For example, the Russian website of PricewaterhouseCoopers (PwC) includes glossy report on the firm’s corporate responsibility programme. It is the market leader in professional services in Russia, with eight offices and over 2,000 staff. Its client base of 2,000 companies includes: every single on of the 10 largest financial services companies and banks; nine of the 10 largest oil and gas companies; seven of the 10 largest power industry companies; six of the 10 largest retail companies; five of the six largest telecommunications companies; four of the 10 largest mining companies; and five of the 10 largest ferrous metallurgy companies. The report states that PwC is a signatory to the UN Global Compact, and in 2009 signed the RSPP’s Social Charter of Russian Business: “a set of principles for businesses to follow that are the foundations of responsible business practices”. PwC’s competitor Ernst & Young also publishes a report on corporate responsibility. It began work in Russia in 1989 and employs 3,000 staff in eight offices. Since 2012 it has had a corporate responsibility expert panel, which brings clients together with representatives of the educational and ecological sectors. Baker & McKenzie was the first international law firm to open an office in Moscow in 1989, and employs more than 120 qualified lawyers in Moscow and St Petersburg combined, including 27 partners. This year it was voted Law Firm of the Year in Russia. Its report, “Doing Business in Russia (2014)”, describes the country’s legal and judicial systems in detail and presents a picture of a properly and normally functioning rule of law. Yet a different perspective comes from Medvedev’s initiative, announced on 27 April 2012: the creation of a new business ombudsman. Mr Medvedev’s last day in office as Russia’s president was 7 May 2012 (he was sworn in as prime minister the following day). 7 May also marked the introduction by Vladimir Putin (who had just been elected president, after serving as prime minister for four years) of a national business ombudsman’s office by December 2012. On 21 June 2012, in advance of the law, Putin appointed business lobby leader Boris Titov as the Ombudsman for Entrepreneurs’ Rights. According to a BBC report published in July 2012, Mr Titov claimed that in the last 10 years Russia has imprisoned nearly 3 million entrepreneurs, many unjustly. He added, “It is hard to find another social group persecuted on such a large scale.” How has this come about? The answer is to be found in two of the most insidious problems of doing business in Russia. These are “criminal prosecutions to order” and “criminal corporate raiding”. In short, there have been complaints for many years that private and state businesses, and powerful individuals, have been able to frame commercial rivals by paying corrupt police officers and prosecutors to plant evidence and make arrests to order. The judicial system itself has been a willing participant in such activities. Another reason for creation of the Ombudsman was the $84 billion in capital that left Russia in 2011: a record amount. Russians were investing overseas because they feared for the safety of their businesses at home. Indeed, many Russian entrepreneurs have fled the country for their own safety. London has even been dubbed “Londongrad” because of the many Russians who have taken up residence and carried out business in the city. The author of this article, who first travelled to Russia in 1983 in the days of the USSR, has since 2003 been employed as an expert witness on Russian law and politics in several cases in the London and Cyprus courts. The cases fall into three categories. First, there have been requests by the Russian Federation for the extradition of Russian citizens resident in the UK, on the basis of criminal charges. Many of these were activities connected with Yukos and Mr Khodorkovsky. In almost all of these cases the English judge found that the requests were politically motivated. In none of these cases has Russia been successful. Second, expert evidence has been given in appeals against refusal of refuge status. Third, there have been commercial disputes in which an important preliminary issue has been the potential for a fair trial in Russian courts, given the continued prevalence of “telephone justice” and the possibility of political interference or pressure from highly placed and wealthy individuals and interests. In fact, prior to his arrest in late 2003 and the destruction of Yukos, Mr Khodorkovsky was the leading Russian exponent of good corporate governance and corporate social responsibility. After two trials and 10 years in prison (he was released in December 2013), he now leads a global campaign to transform Russia into a democracy with an independent judiciary, a viable opposition and free and fair elections. Category: Law Tags: business, Corporate Social Responsibility, Politics society and law, Russia, Work and the economy by Bryony.